AGN-2979 is a tryptophan hydroxylase inhibitor. It shows antidepressant properties in rodent models of depression. 1 2 Gittos MW, Papp M (2001). "Antidepressant-like action of AGN 2979, a tryptophan hydroxylase activation inhibitor, in a chronic mild stress model of depression in rats.". 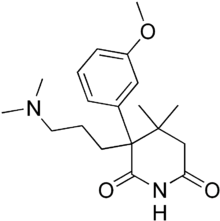 Eur Neuropsychopharmacol. 11 (5): 351–357. doi:10.1016/S0924-977X(01)00103-1. PMID 11597821.